The last revolutionary decade we are living in has turned our memories into digital memories through saving every moment as a photo. Whether by saving photos on your camera storage, laptops, or mobile phones. And for the last one, the more photos you have, the more concerns you get. This is not only because your mobile phone would be hacked or stolen, but also, because of your friends and relatives who give themselves the permission to swap the mobile phone from your hand, open your gallery, and start exploring your photos. The problem is that your phone may contain private sessions or any type of content that you do not want to share with anyone. Fortunately, the more problems the technology causes, the more solutions it gives. And this article is to give you the best solutions to be able to hide photos on Android, and that could be achieved by using one of the available solutions like photo hide apps, special file managers with hiding files function, or the built-in private mode available in some phones. In this article, I will give you the best three methods to hide photos on Android, well-chosen and briefly explained, so follow the upcoming lines. Not all Android phones have the function of hiding photos, but some companies provide what’s known as the Private Mode which lets you hide any content and disable any functions in your phone when activated. We will take some of the companies which provide the Private Mode as an example; The first company will be Samsung, and the second will be LG, then we come to the last company which is Huawei. In general, most of the Android phones that run a newer operation system than 5.0 Lollipop have one of the functions; Private Mode, Guest Mode, or both of them. 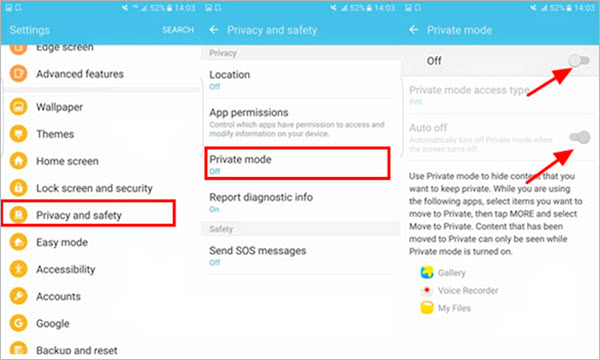 If you are using a Samsung Android phone starting from Galaxy S5, you will be able to activate the Private Mode easily. The Private Mode in a Samsung phone allows you to hide any content in your storage, including photos, videos, music files, and any type of content. First: Open the Settings app in your phone. Second: Scroll down or search directly for Private Mode. Third: Enable the Private Mode by tapping the switch button, and then you will be asked to enter a screen lock. By reaching the last step, you have now activated the Private Mode on your Samsung phone. Now it’s the time to assign your files or photos into the Private mode. First: Head to the Gallery app, My files, or any app you want to hide its content. Second: Select the picture or the files you want to hide. Third: Click on the three dots on the upper right corner of your phone and select Move to Private. 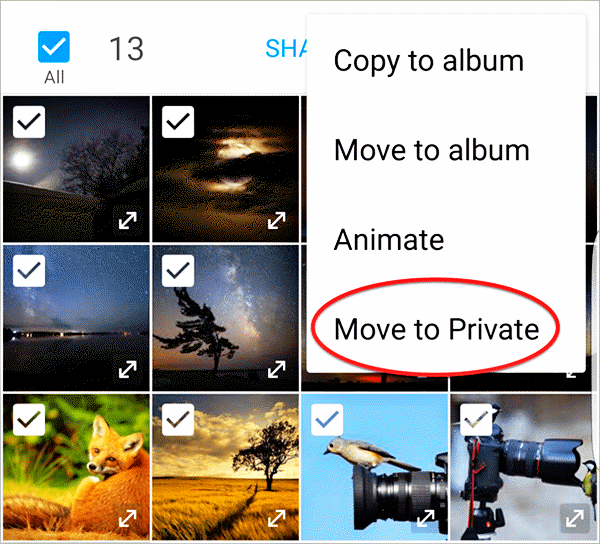 Now, the photos and files you have hidden will be only available when the Private Mode is activated by using its special pattern or whatever the screen lock you have entered. You can enable the Private Mode by clicking on the icon that you can find in the notifications bar. 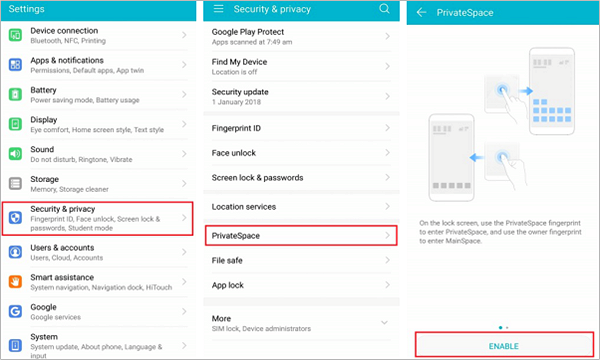 Also, Huawei phones provide a mode called PrivateSpace which you can use to hide pictures on Android. This mode lets you create another a totally another phone with only the functions, apps, and pictures you choose which means you can limit the permissions of the users when activating this mode. First: Head to Settings, and then click on Security & Privacy. Third: Click on Enable to activate Private Space mode, and you will be asked to enter a PIN or a fingerprint for it. Now you can easily switch to the Private Space mode with a touch, without letting the user knows that you have activated it. This mode is only available on a number of Huawei devices such as Mate series starting from Mate 9, Honor V10, Nova series starting from Nova 2, and P series starting from P10. 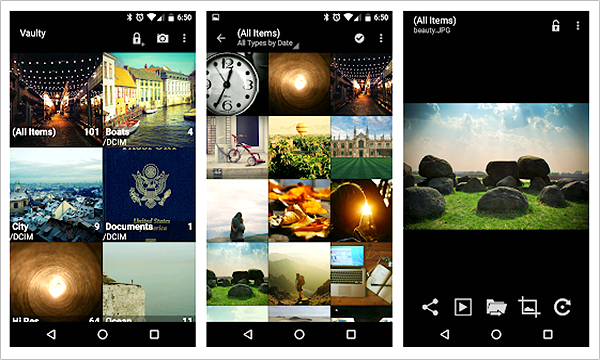 Some UIs like Huawei’s EMUI and HTC’s Sense UI has a Gallery app with hiding photos function. You can use this function to easily hide pictures on Android or to even hide albums on Android. And you will be able to do that without the need to head to Settings and enable special modes. Second: Select the photos or Album you want to hide. Third: Click on the Menu icon on the upper-right corner of the screen and click Hide. Hiding files by using File Manager app is one of the easiest ways to hide pictures on Android phones. Moreover, this method is available for almost every Android phone. This method uses a simple principle which says that any folder has a name starts with “.” can’t be read via the gallery, so all you have to do is to open your File Manager app, create a new folder with a name starts with “.”, and start moving your private photos and videos into it. This way will not allow any sneaker to see your private content via the Gallery app, and you will only have to rename the folder by deleting the “.” to be able to explore its content. 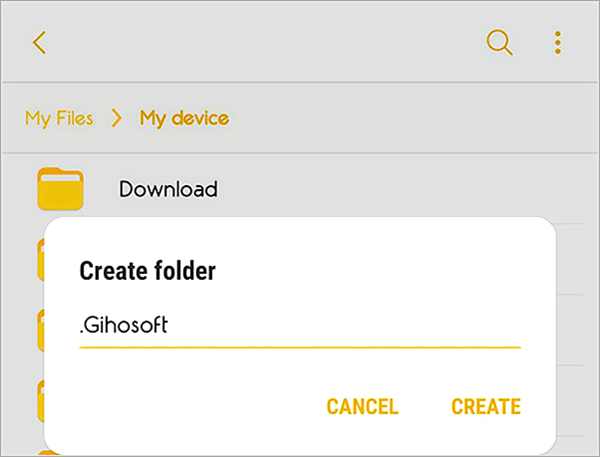 Notice that the folder will be available for those who open your File Manager app so you will have to hide the folder using the File Manager app or a third-party app in order to achieve the highest level of privacy. The last solution I will give you today is using a third-party app that can hide your photos and videos. There are dozens of best apps to hide photos on the Play Store that you can download for free to hide your pictures; Some of them are file management apps, special galleries, or just simple apps to hide photos . In this section, I will explain how to hide pictures on Android using the most common apps in this field, so keep reading. KeepSafe Photo Vault is one of the best photo apps used to hide your photos, videos, and any type of content. It’s well known for its grid view which facilitates the process of hiding your content by using the drag and drop function. It also gives you the ability to protect your files with PIN, pattern, or fingerprints. 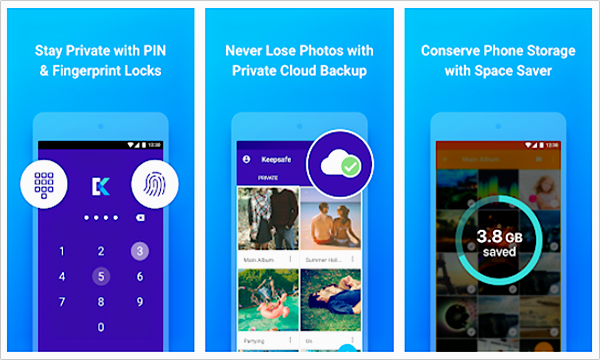 KeepSafe Photo Vault also enables you to save and store your data over the cloud storage with the ability to share it with other KeepSafe users. The app also has two exceptional functions; The first is that it hides so no one knows that you are hiding something by using it. The second is it has a SnapChat-like function that allows you to share a photo or video with another KeepSafe user for only 20 seconds before it deletes itself. 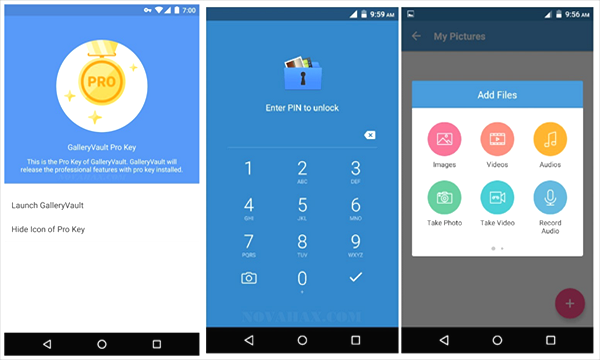 Above all, KeepSafe Photo Vault is totally free and you can download it from the Play Store via this link. Vaulty is the highest rated photo security app compared to any other hiding content application in the Play Store, and it is considered as the best hide app for android. It’s used by more than 5,000,000 users and rated 4.6 out of 5 in the store. The app itself has a gallery which allows you to explore your private photos via it, and it provides a set of albums features; This feature allows you to create sets of albums with different password for each one so you can show your private pictures to those who you only permit to see these photos and not anything else. Moreover, Vaulty has a function to back up all your data to be able to restore it all in case of formatting or losing your phone. One of the best functions of Vaulty is Mugshot which lets it snap a photo of anyone who tries to breach to your protected data and sends the photo to you with the date and time. Vaulty is available for free in the Play Store, and you can download it via this link. Another 5 million downloads application, with a rate of 4.6 out of 5. Hide Something is not just another hiding photos app for its very Special feature which allows you to hide any type of files by clicking on Share button like if you are going to share it via social media or via Bluetooth. It also has the ability to be hidden from the recent apps so no one will know that you are hiding anything from him. Lastly, it’s distinguished with the ability to back up all your data over Google Drive which lets you browse them all using the Google Drive app when you want without the need to unhide them every time you want to see them. Hide Something is a free private photo app so you can download it easily from the Play Store, and it also has a premium version with some additional features you might like. 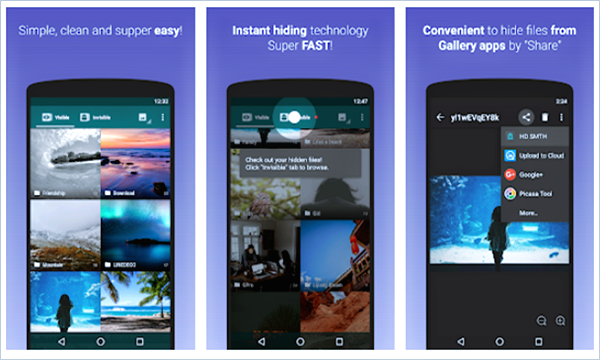 Gallery Vault is the most downloaded photo hide app among the others with more than 10 million installs. It has an elegant and colored interface compared to the others, and it has all the main features like fake-login, stealth mode, shake to lock, cloud sync, and many other features. But what it makes it so special is that it has a built-in private browsing mode, a video editor to edit your hidden content and make great videos of it, and a GIF playback ability not like the most of the galleries. The application is free to download from the store via this link, and there is another Pro version too for $5.99. Tips: Nowadays, photos play an important role in everyone’s life – they help us capture beautiful moments, connect us to the past, and remind us of the people we met, the places we traveled, the feelings and touching stories of the time. However, Life is always full of small accidents, sometimes these precious photos may suddenly disappear or be deleted by mistake, at that moment, you may have broken your heart and wonder how you can retrieve them quickly. Never fear! Actually, the deleted photos are not really gone, you still can recover them by using a powerful Android photo recovery software, like Gihosoft Free Android Data Recovery. Just as it’s name implies, it’s specially designed to help Android users restore deleted files from Android phone. Thus, no matter your photos are lost for whatever reasons, you can quickly recover deleted photos from Android by using this program. The more the usage of the phones, the less privacy we have, this is what I always say. So, in order to keep being protected, you will have to follow one of the above hide pics advice. You can easily do some of them if you have the appropriate mobile phone or can download any free application that will give you the functions you want, but keep in mind that if you can’t take your mobile phone from the hands of the sneakers, you will never be able to protect your data. Don’t hesitate to put your opinion down there in the comments sections, and share your knowledge with us about how do you protect your data.